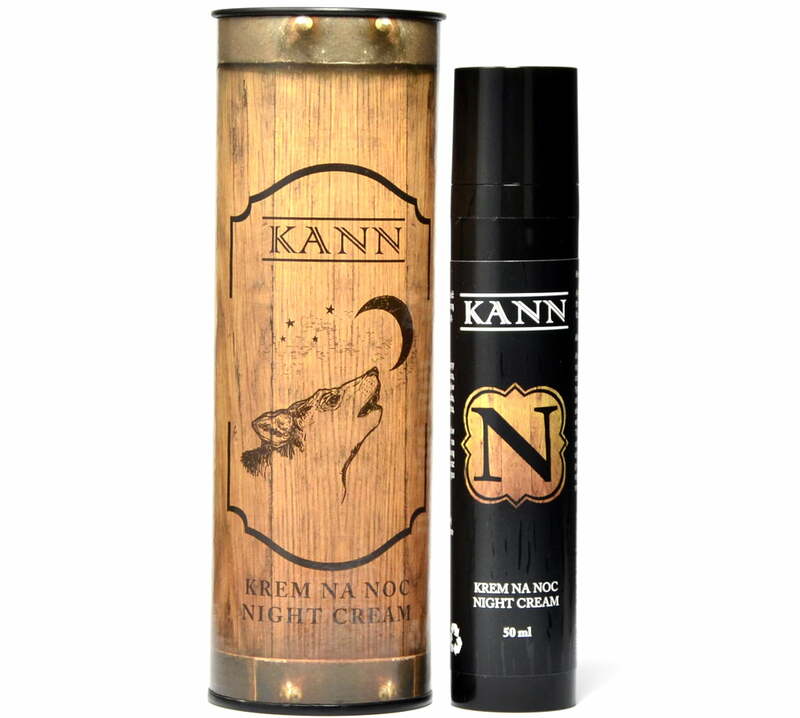 Night cream is a concentrated, rich, natural in 93% formula that combines features properties of several preparations at the same time. Comprehensively nourishes and moisturizes the masculine skin. Contained active ingredients restore the firmness and elasticity, improve blood circulation, help in eliminating imperfections, support the fight with acne. Due to 5 kinds of algae, night cream is a preparation with nutritional, moisturizing, antibacterial and regenerating properties. The complementary effect of all ingredients is the key to this cosmetic. Used together, they form a unique combination of multifunctional character and specific properties. Due to active ingredients, it rebuilds the natural protective barrier of the skin, restores proper hydration of the epidermis, nourishes, provides many vitamins, mineral salts, seals blood vessels, slows down the aging process and stimulates the immune system. Cucurbita Pepo Seed Oil – pumpkin seed oil. A natural ingredient rich in essential fatty acids: oleic, linoleic and linolenic acids. It also contains tocopherols, cartoenoids, phytosterols, squalane, vitamins A, C, E, K and D, potassium, selenium, zinc. It moisturizes, nourishes, smoothes, regenerates, soothes irritations, makes the skin more elastic, lightens discolorations, reduces wrinkles and scars. Theobroma Grandiflorum Seed Butter – Cupuacu. Natural butter extracted from cocoa beans. It contains old, palmitic, linoleic and oleic glycerides, phytosterols, vitamins B, A, C, E and mineral salts. It is a natural antioxidant, a moisturizing, nutritive and protective substance. It restores firmness and elasticity, regenerates, has anti-inflammatory properties and does not cause contact allergies. Triticum Vulgare Germ Extract – wheat germ extract. Natural raw material rich in proteins, lipids, carbohydrates, enzymes, nitrogen compounds, riboflavin, thiamine, niacin, carotene, tocopherol and mineral compounds. It ensures proper hydration of the epidermis, regenerates, nourishes, brightens the skin, combating discoloration. It stimulates the skin’s immune system, blood circulation, antioxidant and anti-aging. Oryza Sativa Extract – rice extract. Natural raw material rich in carbohydrates: starch, hemicellulose, pentosan, cellulose, beta-glucan, glucofructane; proteins, vitamins E and B6, thiamine, riboflavin, niacin, sodium, potassium, calcium, phosphorus, magnesium, iron, zinc, copper and manganese. It has a shielding effect, soothes inflammation, antioxidant, moisturizing, conditioning, improving microcirculation, anti-aging, anti-inflammatory, nutritional and antiseptic. Glycine Soja Seed Extract – soya extract. Natural raw material rich in proteins, lipids, carbohydrates, minerals and vitamins: E, B1, B2, B6, nicotinamide and pantothenic acid. It also contains large amounts of isoflavones: genistein, daidazine and glycine. Soy slows skin aging, deactivates harmful enzymes, improves skin thickness, relaxes, stimulates collagen synthesis, has antioxidant properties, moisturizes, smoothes and seals blood vessels. Fucus Vesiculosus Extract – bladderwrack extract. Natural raw material rich in alginic acid, laminarin, fucoidin, oligoelements, iodine, sodium and potassium chlorides. It also contains bromides, magnesium, iron, silicon, carotenoids, vitamin C, B1, B12, phenols, acrylic acids, lipids and amino acids. It works strongly moisturizing and antioxidant. It revitalizes, protects against external factors, improves microcirculation, eliminates fine wrinkles, nourishes, regenerates, normalizes sebum secretion, smoothes, soothes and acts antioxidant. Enteromorpha Compressa Extract – algae extract. Natural raw material rich in carbohydrates, proteins, lipids, vitamin C, sodium, magnesium, potassium, iron, manganese, iodine and wpan. It increases the elasticity of the epidermis, stimulates collagen and elastin, preventing their degradation. Prevents the loss of firmness, moisturizes, nourishes, reduces wrinkles, protects against photo-aging. Porphyra Umbilicalis Extract – nori seaweed extract. Natural raw material rich in agar, carrageenan, xylan, manan, porphyran, odontalan, anfeltan and furcelan. It also contains polysaccharides, biliproteins, carotenoids, vitamins A, B and C as well as calcium, iron, potassium and magnesium. It is a natural UVA and UVB sunscreen, moisturizing, nourishing, protecting, anti-wrinkle, antioxidant, firming and soothing. Undaria Pinnatifida Extract – an extract of the undaria algae known as wakame. Natural raw material rich in polysaccharides, amino acids, proteins, vitamins, magnesium, manganese, sodium, iron, potassium, calcium, B vitamins and polyunsaturated fatty acids – DHA and EPA. A natural blocker of tyrosinase – an enzyme responsible for the formation of discolorations. It smoothes and reduces wrinkles, moisturizes, regenerates, nourishes, firms and prevents aging. It has antiviral, anti-bacterial, antioxidant and antioxidant character. Lithothamnium Calcareum Extract – red coral algae extract. Natural raw material rich in calcium, magnesium, iron and manganese, and carotenoids: alpha- and beta-carotene, lutein, zeaxanthin, protecting against free radicals. Substance with large amounts of polysaccharides, phytosterols. It strengthens, regenerates, moisturizes, nourishes and prevents aging. It improves skin vitality, prevents edema. It has a DNA cell against UV radiation. Persea Gratissima Fruit Extract – avocado extract. Natural raw material rich in: oleic, palmitic, palmitoylic, stearic and linolenic acids; vitamins A, C, D, E, K, H, B, PP; calcium, potassium, phosphorus, lecithin, phytosterols, chlorophyll and squalene. Nourishes, moisturizes, firms, regenerates, protects the skin against external factors. Antioxidant, anti-aging, anti-wrinkle, soothes irritations. It is antiseptic, strengthens blood vessels, soothes and smoothes rough and dry skin. Sodium Hyaluronate – equivalent to naturally occurring in the body of hyaluronic salts, strongly moisturizes, rejuvenates, improves skin elasticity, regenerates, anti-inflammatory, eliminates shallow discoloration and scars. Capable of capturing ions of heavy metals and other toxins, thanks to which it nourishes the skin and acts anti-allergenic. Antioxidant, eliminating wrinkles. Humulus Lupulus Extract – hop extract. Natural component obtained from hops cones, rich in xanthumol, flavonoids, triterpene, tannins, rutin, resins, terpenes, sekskiterpenes, phytohormones, sulfur compounds and tannins. Cleansing, antiseptic, antibacterial and antifungal. It normalizes the secretion of sebum, narrows pores, soothes inflammation and accelerates wound healing. Antioxidant, inhibits the oxidation of vitamin C, strengthens blood vessels, prevents skin aging. Glycyrrhiza Glabra Root Extract – licorice root extract. A natural substance soothing irritation and redness, accelerating wound healing, regenerating and brightening shallow discolorations. Antioxidant with nourishing effect, strengthening blood vessels. Gluconolactone – polyhydroxy acid. A substance found naturally in human skin. Strongly moisturizes, strengthens the skin, soothes redness and irritation. It seals blood vessels, eliminates shallow blemishes and scars. It stimulates the synthesis of proteins in the skin, acts anti-aging, anti-seborrhoea, antioxidant, firming and exfoliating. It prevents the formation of blackheads. PH regulator. Calcium Gluconate – natural, mineral substance, anti-inflammatory, anti-exudative and anti-oedematous. Strengthens and shrinks the walls of blood vessels, soothes allergy symptoms. Moisturizes, has antiseptic and healing properties. Lactic Acid – organic hydroxy acid, a natural component of skin and hair. The main component of NMF (Natural Moisturizing Factor) moisturizes and softens the stratum corneum. Unblocks clogged pores, prevents the formation of pimples, has antibacterial properties. PH regulator. The product is intended for all types of men’s skin. In case of heavily dehydrated, dry and rough skin requiring a higher dose of nutrition, we recommend using cream twice a day. Apply a small amount of the product to cleansed facial skin and massage it. Aqua – water, solvent for hydrophilic substances. Decyl Isostearate – emollient characterized by low risk of oxidation, preventing the appearance of irritants, causing the appearance of allergies. Conditioning substance. Isostearyl Isostearate – liquid wax, emollient. The substance protects against water escaping from the epidermis, lubricates, protects and soothes. Distarch Phosphate – natural substance derived from corn starch. A substance that absorbs moisture, matting, preventing the “glow" effect. Propylene Glycol – propylene glycol, a solvent for water-insoluble substances, a moisturizing agent, a good transition promoter for active ingredients. Glycerin – natural substance with strong moisturizing and softening properties. It is a promoter that helps transport active substances deep into the epidermis. Soothes irritations, eliminates small wrinkles, accelerates regeneration. Neopentyl Glycol Diethylhexanoate – emollient, a softening substance that prevents water loss from the epidermis. Cetyl Alcohol – natural fatty alcohol derived from palmitic acid from palm kernel oil. Emulsifier and emollient, prevents the loss of water from the epidermis, conditions, softens and smoothes the skin and hair. Glyceryl Stearate – natural emollient and emulsifier, a substance with smoothing and conditioning properties. Isostearyl Alcohol – emollient, substance with smoothing properties, helping to maintain a constant level of moisture. Butylene Glycol Cocoate – emulsifier, a constitutional substance. Octyldodecyl Stearoyl Stearate – natural substance that prevents drying of the skin. Moisturizes, smoothes the skin, softens and protects against external factors. Enteromorpha Compressa Extract – algae extract. Natural raw material rich in carbohydrates, proteins, lipids, vitamin C, sodium, magnesium, potassium, iron, manganese, iodine. It increases the elasticity of the epidermis, stimulates collagen and elastin, preventing their degradation. Prevents the loss of firmness, moisturizes, nourishes, reduces wrinkles, protects against photo-aging. Sodium Benzoate – preservative, protecting against the restoration of mold, fungi, microbes and acetic bacteria. Potassium Sorbate – preservative permitted for the production of natural and vegan cosmetics. It inhibits the growth of mold or bacteria. Disodium EDTA – preservative, chelating and stabilizing substance that binds heavy metal ions, protecting the cosmetic from deterioration, loss color and odor. A water softening component that allows the product to work properly even when in contact with hard water. Carbomer – a polymer of acrylic acid. Thickening agent, regulating the viscosity. Xanthan Gum – substance of natural origin, produced by the Xanthomonas bacteria in the fermentation process. Gelling ingredient, emulsifier. Phenoxyethanol – preservative with a pleasant aroma. Ethylhexylglycerin – moisturizing substance, humectant. A preservative found in over 20 years in the pharmaceutical industry. Ethylcellulose – natural gelling agent, thickener, viscosity regulator. Triethanoloamine – the substance helps in the formation of emulsions, pH regulator.